Petroleum refineries and fuel distribution companies are subject to growing pressures from society and regulators to significantly reduce their greenhouse gas emissions and develop a more environmentally-friendly footprint. This trend is actually involving the whole European community. Fuel oil consumption is under increasing environmental pressure with stricter regulations on use in marine transportation. Emissions from diesel fuels from fossil sources have been under scrutiny in recent years from regulators and public opinion. Companies are striving to become more sustainable by replacing traditional fuels with a renewable alternative, such as biofuels. Different energy sources for mobility has recently emerged around the concept of the electric vehicles and fuel cells and are penetrating the transportation market. Stefano Milanese, Partner at Arthur D. Little, a leading international management consulting firm specializing in the energy and chemicals industries, spoke at the European Refining Technology Conference (ERTC) in November about the future of renewable fuels and biofuels and how refineries can respond to market trends. What are the options for refiners to respond to the new trend and market developments? Mr. Milanese: There are different potential insertion points for bio fuels or bio mass at the fuel production value chain. The very simple one is to replace part of the crude oil at the distillation process by renewable feedstock. This has limited viability, unless the material is essentially purely composed of carbon and hydrogen, with minimal levels of olefins. The most interesting insertion point for renewables into the refineries is as “Biomass/Renewable Intermediate” fed into conversion processes (i.e. Hydrocrackers, FCCs, Cokers) or into finishing processes (i.e. Hydrotreating) or specialty units (i.e. Isomerizing, Reforming, Alkylating). The lower risk and lower effort insertion point is to blend bio components into near finished fuel. What are the barriers or risks for refineries in using bio components? Mr. Milanese: Refiners look forward to maintaining a safe, reliable, predictable and profitable operations. From this point of view there are different levels of risk associated with the characteristics of the bio component to be used and the place of the fuel production process it will be inserted. For well defined, consistent quality, such as single molecules (i.e., ethanol, butanol) used at blending units, the risks are limited to the potential stability, toxicity and other environmental issues. For medium intermediates requiring only minor treating (e.g. triglycerides, some direct liquefaction oils) feeding hydrotreating units and followed by blending, the risks also include: understanding process performance on new feeds and blends with petroleum-based feeds, enabling larger fractions of bio-oil blending stocks while still meeting product specs and providing sufficient hydrogen to meet hydrotreating demands. feedstocks with less data on conversion behavior. Major players in the Downstream industry are at institutional level looking to switch to an industrial and commercial configuration where renewable fuels take a larger share, but have not yet adopted this option on a broad basis. There would be some incentives for refiners who want to move to biofuels and specifically the use of second and third generation of fuels for their production. Refining is a well stablished business and with a relatively standard configuration and operations, so any industrial and commercial strategy for switching to a more renewable feedstock will need time to be implemented, adjusting their plant to produce efficiently and train personnel accordingly. Refiners are aware of the fact that this switch does not come without costs and they will need to make significant investments. Mr. Milanese suggests that European refineries need to monitor and consider in a broad basis the range of biocomponents available for their industrial and commercial operations in a flexible manner. 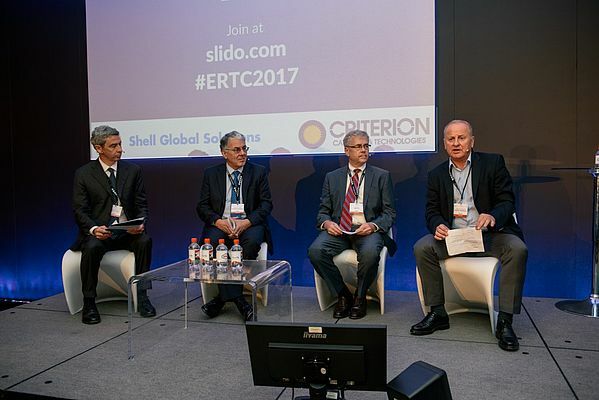 At ERTC, Mr. Milanese addressed the range of different clean component options that refiners can exploit such as methanol and more sophisticated components Methanol or ethanol have been an option for refiners in America and is highly developed in the region due to the amount of resources available. In Europe, methanol will be hard to produce as it requires relevant land use. European policies and directives urge transport fuel suppliers to provide an increasing share of renewable and low-carbon fuels, including advanced biofuels, renewable transport fuels of non-biological origin, waste-based fuels and renewable electricity. The European Union is encouraging research into renewable fuels and investment in innovation by supporting companies and research institutions financially. European refiners will need to look at the entire fuel and energy value chain and seek alternative options that will be better suited to them. Operational and commercial flexibility of European refineries is fundamental to establish a solid platform for the future and it is very likely that it will imply a radical reorganization in the light of more integrated energy companies. Refiners are aware that the market is evolving and that their role is changing. It is as yet not clear when renewable fuels and components will take a significant role, but there is no doubt that renewables are taking over, and now more than ever, companies are working hard toward achieving cleaner production. There are numerous opportunities for European businesses to ‘go green’ but that change needs to be embedded within an industrial and commercial strategy if they are to prosper and remain competitive.